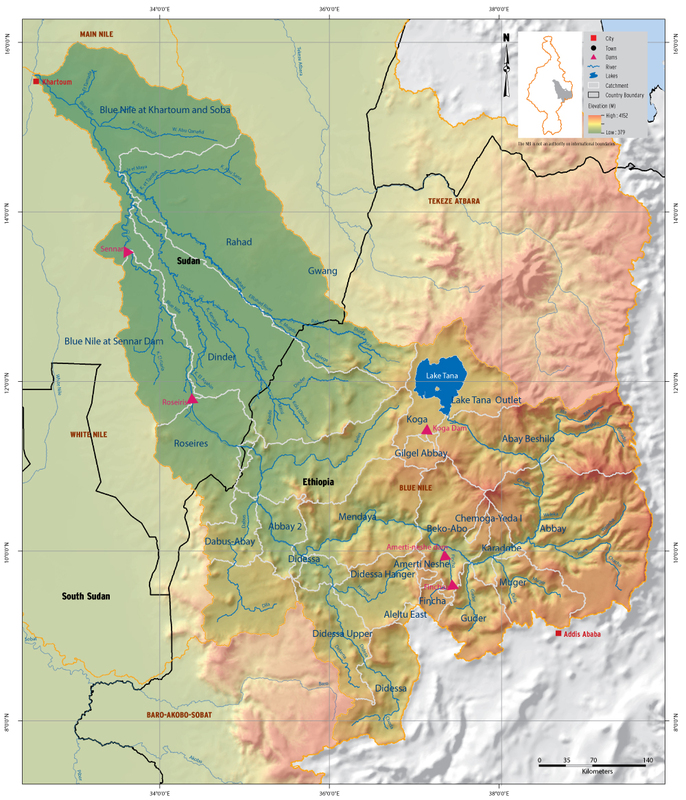 The source of the Blue Nile is the Little Abbay River in the Ethiopian Highlands. The Little Abbay flows into Lake Tana, which discharges into the Blue Nile and runs 900 km down through the highlands into Sudan (Roskar, 2000). Other rivers which flow into Lake Tana. Blue Nile contributes about 60% of the flow of Main Nile (Sutcliffe and Parks, 1999). From the Sudanese-Ethiopian border the Blue Nile flows north from humid to semi-arid conditions and there is usually little additional runoff north of Roseires. The exceptions are the two tributaries, the Ayma-Dinder and the Rahad. This part of the sub-basin is characterized by a highly seasonal rainfall pattern, most of the rain falling in four months (June to September), with a peak in July or August. The precipitation over the Blue Nile sub-basin (in Ethiopia) varies from 1000mm in the north-eastern part to 1450-2100 mm over the south-western part of the sub basin. The average annual potential evapotranspiration over the sub-basin is 1,765mm. Soil erosion is a major threat in the Blue Nile Basin (Conway and Hulme, 1993).